Every month, there are officially a gazillion cat videos uploaded to the Internet, which is obviously a great and virtuous thing. But sometimes, even the most dedicated feline fancier doesn’t have the time to sift through them all. So let us step up and present to you the five absolute must-watch cat videos for November 2018. Anyone for a couple of kittens in a box? Here we have an adorable domestic shorthair who is totally smitten with a hole in a box and enjoying a little neck rub against the cardboard. Enter an equally cute tuxedo kitten who’s clearly envious of the prime spot in the cardboard box. You can always rely on Yves the Cat to come through with the entertaining video content, and here the self-proclaimed “chillest cat in the world” decides to play along to Ben E. King’s “Stand By Me.” Never before have you seen or heard a feline nail file used as percussion. The English Premier League soccer season is well underway, which means fans of the sport living in the United States are waking up super early to catch games. One of those followers is Belle, a tenacious cow cat who seems to be under the impression that she’s playing the position of goalkeeper for Chelsea FC. Have you ever looked closely at your cat’s pupils? Like, really closely? Let Bobbie’s eyes hip you to the weirdness. Move over Maru! Hana is here to take your spot. In this case, quite literally. Never has a cat’s tail been this happy! 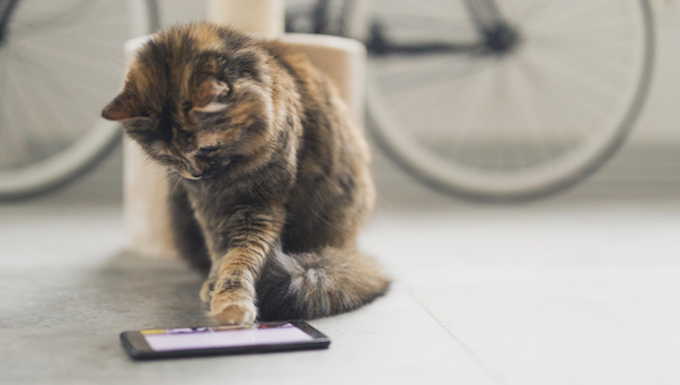 Did we miss your favorite cat video of the month? Put it on our radar in the comments section below!